Buddhism is the third most widely followed religion in the world. Know more on this religion by reading the article. Buddhism is a religion based on the practicality of life. It is not based on any hypothetical and supernatural facts. It only comprises different traditions, beliefs and practices based on the teachings of the Buddha. The word 'Buddhism' came from 'Buddha' which means 'one who is awake to see the reality of life'. Siddhartha Gautama was called the Buddha after he attained enlightenment. The main spiritual goal of Buddhism is to attain 'Nirvana', which means freeing the soul from an unending process of reincarnation. 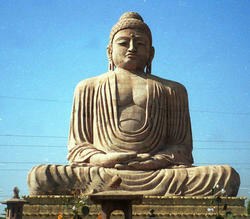 The place where Buddha achieved enlightenment, Bodhgaya, is considered to be the birthplace of Buddhism. From here Buddhism gradually spread throughout the world. Asian countries were mainly influenced by Buddhism and its beliefs. Buddhism is considered to be one of the oldest religions practiced today. The scriptures of Buddhism are known Tripitaka. It was written in Pali, a very ancient language of India and the scriptures are an important part of the Pali canon. This is the language which was also spoken by the Buddha. The teachings, prayers and hymns of the Buddha in the Tripitaka tell us about Karma. Besides this, it also says to be honest, patient, obedient, and tolerant but above all one must follow the path of goodness and peace and should help others. The lessons are based on his own observations on how exactly things are. Gautama Buddha was born around 2,500 years ago in Lumbini, Nepal though his exact date of birth and death is uncertain. He was the son of a King Suddhodana who ruled a tiny kingdom called Kapilavastu. His mother was Queen Maha Maya. At the age of 29, Gautama for the first time came to know death and suffering when he visited his subjects. So, he left home and began to lead a life of an ascetic to discover the truth of life. He first went to Rajagaha and lived begging alms. Later he left the place and came under the tutelage of two hermit teachers. After mastering their teachings but still unsatisfied in his quest he decided to move on. He then realized that meditation is the key towards knowing the truth. So, he sat down for meditation under a sacred fig tree popularly known as 'Bodhi Tree', in Bodh Gaya. After 49 days of deep meditation he achieved enlightenment and people came to refer him as the 'Buddha'. After achieving enlightenment he, on the request of people started preaching. After a lifetime of teaching and gathering a large number of followers and devotees to his fold, he died at Kushinagar, India. According to him, all things are momentary and you can free the spirit from your body without dying by strong meditation and controlling the six senses such as sight, hearing, smell, touch, taste and pain. He is considered by Buddhists to be an enlightened teacher who communicated his visions and understandings to help people suffering from grief (or dukkha) and achieve nirvana. And thus, people started following his lessons to live happily and peacefully in their lives. The essence of Buddhism lies in the fact that it considers everyone as equal. Buddhism also states that nothing is eternal and everything happens for a reason. One of the earliest and most popular followers of Buddhism was the great King Ashoka. Two of the earliest schools of Buddhism are Theravada and Mahayana. Theravada Buddhism prospered in Sri Lanka, Burma and South East Asia while Mahayana Buddhism flourished in India, China, Japan, Tibet and Central Asia. Later a school of Mahayana Buddhism, Vajrayana, was widely followed in Tibet and Mongolia. On the whole, several centuries after the death of the Buddha, Buddhism managed to spread throughout Asia. Numerous monasteries and stupas were established, some of the oldest ones are still standing today. Ancient Buddhist universities like Nalanda, and caves like Ajanta and Ellora and are very famous today. Buddhism gained popularity in China around the 1st century CE. In Korea, it came into practice in the 4th century CE and from there it extended to Japan in 538 CE and by the end of the era, it became the state religion of the country. An Indian tantric teacher, known as Padmasambhava, is credited with spreading Buddhism in Tibet. It is only by the 19th and 20th century that Buddhism spread to western countries. The major tenets of Buddhism are the Four Noble Truths. The Four Noble Truths were the first teachings of Buddha after attaining enlightenment. He taught that reality is suffering and every suffering is caused due to people's tendency to cling to existence. The suffering can only be stopped through nirvana through the path shown by him. Nirvana means ending your negative aspects like violence, anger, desire and ignorance. According to the Buddha, these noble truths can be achieved by following the 'eight fold path', comprising of: right view, right though, right speech, right action, right livelihood, right effort, right mindfulness and right concentration. By the seventh century, Buddhism in India started to decline because of the growth of Hinduism. But, it again regained the popularity and now it is widely followed in India. At present, Buddhism has spread to almost every part of the world. It is estimated that about 376 million people follow this religion. In China and Tibet, Buddhists constitute a majority. This religion is also becoming popular in countries like Australia, America and United Kingdom. The main pilgrimage sites of Buddhists in India are Lumbini, Bodh Gaya, Sarnath, Kusinara (now Kushinagar), Sravasti, Rajgir, Sankasia and Vaishali. In Afghanistan, it is the Bamiyan Buddhas. In Cambodia, Angkor Thom and Silver Pagoda and in Japan, Kyoto, Nara, Shikoku, Kansai Kannon are particularly famous. In Myanmar, Bagan, Mandalay Hill, Kyaiktiyo Pagoda and Shwedagon Pagoda are important pilgrimage sites. In Nepal, Bodhnath Stupa, Swayambhunath and Kapilavastu are a must visit for both devotees and tourists. In Sri Lanka, Anuradhapura (the Atamasthana or 'eight places of worship') and the Temple of the Tooth (Kandy) and in Thailand, Sukhothai Ayutthaya are also important pilgrimage destinations. Buddhist festivals celebrate the three jewels, namely, the Buddha, the Dharma (the Buddhist teaching) and the Sangha (the spiritual society). There are three main festivals that Buddhists throughout the world celebrate. Vesakha is a festival that encompasses the birth of Buddha, his enlightenment and death in one day. It is celebrated on the 1st full moon of May and if it is a leap year in June. Dharma Day is celebrated in honor of his teachings in the month of July. Dharma Day was first celebrated in Sarnath, in northern India, and from there it came into practice. Sangha Day is celebrated in November to honor the spiritual community. On this day, people exchange gifts. It is mainly celebrated by people in western countries. Parinirvana Day is celebrated, in February, to commemorate the achievement of complete nirvana of the Buddha upon his death. On this day, followers meditate to pay tribute to Buddha. Buddhism is the world's fourth largest religion after Christianity, Islam and Hinduism. Buddhism teaches us how to control negative traits like anger, jealousy and violence. It preaches one to develop positive thoughts like love and wisdom. Meditation is an important facet of Buddhism as it helps on in living a happy and peaceful life.